A Year of Being Here: Nura Yingling: "Step Six and Step Seven"
Let me be where I am. 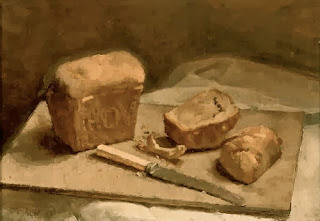 Let this bread, this morning, be their own ceremony. Let me pass the gilt mirrors without looking. let my breath be forgiveness returned for her black sadness. "Step Six and Step Seven" by Nura Yingling, from for Holding Silence. © BlazeVOX, 2013. Image credit: "Hovis Bread and Knife," painting by Alan Gwynne-Jones, 1945 (originally color).